“The call quality was very good and we felt like we got a call from our next-door neighbor”. A shock wave was sent to the Western powers when on Friday the North Korean leader, Kim Jong-un announced that the country has suspended nuclear and long-range missile tests since further tests are unnecessary. In the last ten days, people around the world have witnessed two different approaches by the different leaders. They saw the uselessness of the forces of war in Syria versus the constructive power of peaceful plans in Koreas – one to increase endless hostilities by military strikes and the other to reduce tensions by compromising and embracing diplomacy. 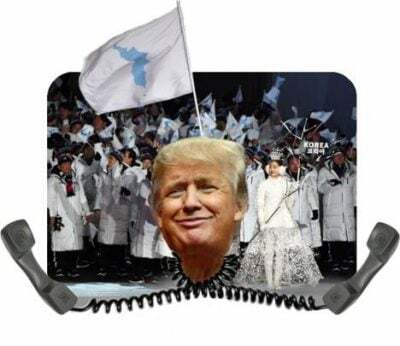 Following the North Korea participation in the last Winter Olympics in South Korea; now for the first time; North Korea’s leader, Kim Jong-un, and President Moon Jae-in of South Korea will meet on April 27, in the PEACE HOUSE on the southern side of the DMZ (in South Korea). This is a monumental shift and a new stage in the global political situation. For true peace activists, this optimistic situation should be a turning point in organizing a Global Union for Peace. The impact of denuclearization of a region without firing even a single bullet is tremendous. In the Middle East, people with different religions and sects were living together peacefully as neighbors or even as integrated societies with common interests for centuries. The aftermath of the Korean Summit, will have the suffering people and refugees in the troubled regions from Africa to Asia to ask if it is possible to follow the Korean experience and reject the influence of foreign military powers and find peaceful solutions to arbitrary and injected problems? This radical idea is a nightmare to the warlords of the most powerful countries. This fact alone is another aspect that all true peace activists should be aware of and be prepared to counter the incoming barrage of lies and misinformation about the North and South Korean Summit that already has started. By devaluing the significance of the summit with North Korea, the US media is questioning the “real intention” of Kim Jong-un! They are warning the White House in many ways to be cautious about this “dangerous dance”! There is no doubt after the failure of the “chemical attack” campaign, the successful “people to people” diplomacy in Korea, will push the warlords closer to a naked global war that has already begun by proxy. Unfortunately, today there are a few people and forces like Mr. Netanyahu of Israel who are in a position to ignite a nuclear war indirectly at any moment. This fact makes the task of true peace activists undeniably more intense and indisputable. The Korean people are showing in practice that PEACE outside of the US influence is possible. Sending a delegation of well-known peace activists to North and South Korea in support of Korean people for their initiative for PEACE is in order. These Peace Ambassadors can reflect and inform people outside of Koreas first hand of the true situation in both countries – a rare opportunity for all peace loving people.